Warwick defense in play-off mode against Valley Central. Photo: Al Konikowski. 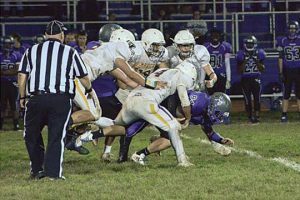 Warwick defeated Valley Central in a Division II contest Friday, Oct. 13, to secure the League Title. The Cats finish the season 6-1 and undefeated in conference play. Warwick was paced by an outstanding rushing attack led by Harrison Parrelli’s 204 yard on the ground. Jared Senius rushed for 134 yards and Kyle Rooney, Connor Perez, Joe Miller and Matt Hansen combined for an additional 90 yards. Senius connected with Perez for a 26 yard scoring strike in the second quarter. The offensive lines have put together great back to back weeks paced by seniors Nick Fotino, Jason Hranitz, Dan Jeleniewicz, Lucas Triantis, Eddie Kerrisk, Rich Mascal, Isaac Roman, Alexander Avery, Dylan Claudio, Shea Gormley, and TE Andrew Wiezbicki. The Defense was paced by Wiezbicki, Sean English, and Dan McNally, who recorded seven tackles each. McNally added 2½ sacks. Matt Houlihan had an interception for the Wildcats. Jaquil Tucker, Connor Perez and Grant Dolshun had pass breaks up for the Section 9 Top Seed. Warwick will host Middletown Friday, Oct. 20 in a Section IX home play-off game. Fans, parents, athletes, and friends from Middletown are encouraged to wear pink in recognition of Breast Cancer Awareness Month.